Keep hair from falling flat with the Moroccanoil Destination: Volume Travel Set, featuring argan oil-infused Extra Volume Shampoo and Conditioner to naturally plump strands and Root Boost to amplify texture and body. 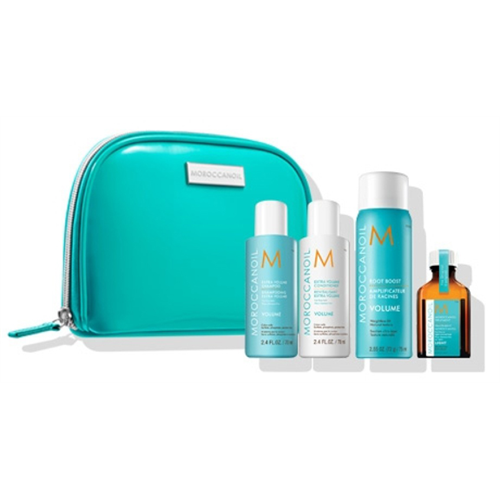 This limited edition set comes in a cosmetic bag so that you can easily bring the products you need everywhere from the gym to your weekend away. Extra Volume Shampoo:Works weightlessly to gently cleanse and add volume to fine, limp hair. Extra Volume Conditioner: Volumizes, detangles and gives fine hair body, shine and manageability without weighing it down. Moroccanoil Treatment Light: The original foundation for hairstyling that can be used as a conditioning, styling and finishing tool. Rich in argan oil and reparative proteins. Specifically formulated for the delicate needs of fine and light-colored hair. Root Boost: Lifts roots to add volume to medium to fine hair for long-lasting texture, body and movement.